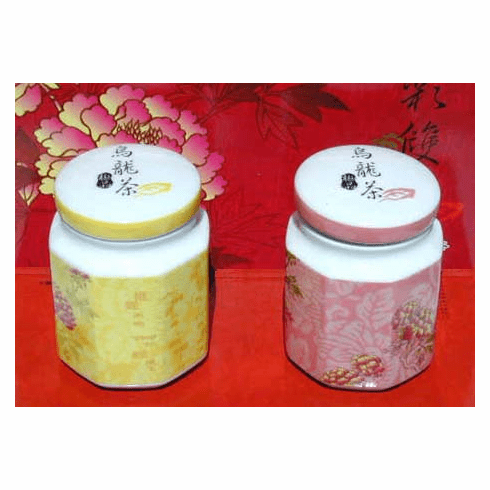 This gift set contains two beautiful ceramic jars of very good quality green oolong nestled in satin. The mauve jar contains 4 ounces (113g) of Alishan Oolong. Developed around 10 years ago, the tea estates on the Ali Mountain (also known as Alishan) produce the newest type of high mountain oolongs. At the elevation of 950 to 1000 meters, the mountainsides are covered with fog or clouds which are ideal for growing Oolong. The steeped tea has a pale yellow color matching its faintly fresh scent. Once tasted, the tea presents itself with a fresh taste followed by a faintly sweet aftertaste. The yellow jar contains 4 ounces (113g) of High Mountain Oolong. Considered on of the most popular oolongs, this tea is harvested from the highest mountains in central Taiwan. The steeped tea has a light green-yellow hue, sweet flora aroma, fresh initial flavor, and a sweet floral aftertaste which lasts after the sip. The dimensional shipping weight is 9.00 lbs. Temporarily out of stock.